In root canal treatment, the space inside the tooth from the center, known as the pulp chamber, that travels down the length of the root to the tip (or apex) is called a "canal," or more specifically, a root canal. Human teeth may have one to four root canals, depending on the anatomy of the tooth. Molars, may have 2 to 4 canals, premolars may have 1 to 2 canals, cuspids may have 1 to 2 canals, and finally, incisors generally have 1 canal. Extra canals may branch out from the main canal, called "accessory canals." The number of canals and the anatomy can vary among teeth. Tooth decay invades the tooth, penetrating through the enamel and then the dentin into the pulp. A tooth has become abscessed (also known as infected) from decay. Root canal therapy can be performed in single or multiple visits. Before the procedure, though, your dentist will advise you as to the number of appointments necessary to complete the canal. If you had an infection or abscess in the tooth, the dentist may choose to have you start antibiotics before completing the root canal. 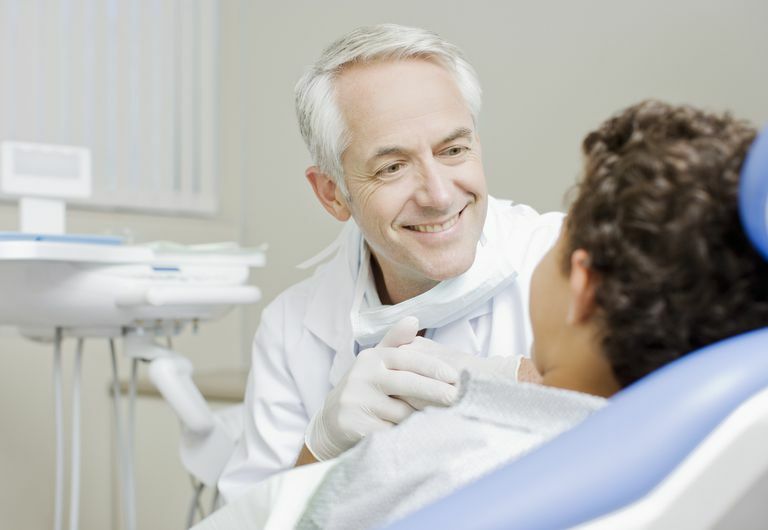 Your dentist will begin the appointment by giving you local anesthetic to "numb" the tooth that is being worked on. The dentist will place a rubber dam over your mouth. This plastic shield, made from either latex or non-latex materials, is used to keep the tooth isolated from your saliva and very dry before the final steps are taken to complete the procedure. The dentist will use different chemical solutions to disinfect the inside of the tooth. The rubber dam is helpful in keeping these solutions from entering your mouth. Next, the dentist will begin the procedure by drilling a small hole through the tooth into the area known as the pulp chamber—this is where the nerve of the tooth is located. Once the dentist is confident that the entire tooth has been cleaned out, the tooth is dried with tiny absorbent paper points. When completely dry, the dentist will place a material (called "gutta percha") into the tooth. Gutta percha is a rubber material designed to seal the inside of the tooth. Your dentist will remove any remaining decay from the tooth and will decide to either put a temporary filling on to close the tooth or proceed with placing a permanent filling. If your root canal is performed by an endodontist, a dentist that specializes in root canals, he will place a temporary restoration and send you back to your general dentist for the restoration. Chances are, your dentist will recommend having a crown put on to the tooth. Since the nerve and blood supply to the tooth has been taken away, the tooth may become brittle over time, resulting in a cracked tooth. A crown is designed to prevent this from happening. When the local anesthetic has worn off, your tooth may be sore from the procedure. Your dentist may recommend a pain reliever to take at home, and depending on the circumstances behind your root canal, antibiotics may be prescribed to clear up any remaining infection in the tooth. If you were on antibiotics before the procedure, your dentist will instruct you to finish the remaining medication. The American Association of Endodontists. "What is Endodontic Treatment?" The American Dental Association. "Root Canal (Endodontic) Treatment. The Canadian Academy of Endodontics. "Patient Learning Centre- Endodontic Treatment." The Canadian Dental Association: Your Oral Health. "Root Canal Treatment."